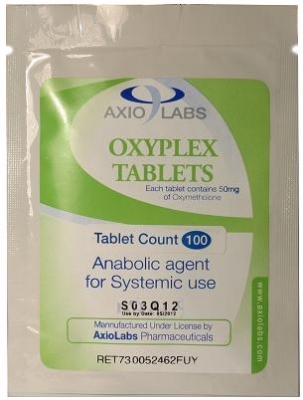 Oxyplex by Axiolabs is a synthetic anabolic-androgenic steroid which contains 50mg per tab of the hormone Oxymetholone. Usually it is commercialized in 50 tabs pouch. This steroid was developed in 1960 and and is often used in treating different diseases, such as hypogonadism, delayed puberty, anemias, HIV infection,burns. Also it is good in correcting hereditary angioneurotic edema, managing carcinoma of the breast, promoting a positive nitrogen balance following injury or surgery, and stimulating erythropoiesis. Also known as Anadrol/Anapolon in bodybuilding, this steroid has almost the same proprieties as Dianabol. Many athletes like to take it in their bulking cycles, because it is considered effective drug for increasing body weight. As a synthetic derivative of testosterone (specifically dihydrotestosternone), oxymetholone exhibits a positive effect on nitrogen balance in athletes who combine this drug with a high protein diet. Oxyplex does not affiliate very good to the androgen receptor so the most part of anabolic effect it gives is via non-androgen receptor-mediated effects. Oxymetholone has great effects for extensive body mass gain, due to highly improvement of the protein synthesis. Oxymetholone is hepatotoxic steroid. It is good to be taken 100 mg and not more than 8 weeks. A common approach for taking oxymetholone is to split the daily dose in half and then administer twice, once in the morning and once in the evening (eg. 25 mg x 2 or 50 mg x 2). There are many fans of oxymetholone, who incorporate it as a kickstart to a cycle or in addition to a bulking stack, that contradict all the negative reports on oxymetholone. Oxymetholone should not induce estrogen related side effects since it is a DHT derivative and therefore not subject to aromatisation , however, gyno has been reported by some athletes using this drug. Oxyplex does not produce aromoatization. When talking about combination it is good to stack it with testosterone, nandrolone, Primobolan. One important thing that must mention that is not effective with Anastrozole, Femara, or Exemestane. Side effects that can occur are: increased blood pressure, headaches, and back pumps. Increased liver enzymes is practically a given, as it will be with almost all oral steroids, and is certainly dose related. Oxyplex can convert to estrogen if it is combined with aromatizing steroids such as Deca Durabolin, Testosterones or Equipoise, but you can avoid this by using Tamoxifen (Nolvadex).